Even as several other posts lie unfinished in my drafts from Vansh's birthay celebrations (with pictures for those who are looking forward to those :) ), Jiya's 21st month update (which incidentally started as her 16th month update back in the US), this one certainly takes precedence over all the rest. For undoubtedly its a huge step. To come to think of it as one of the most important journeys a human being undertakes would be perfectly apt; the journey to knowledge, to empowerment, the journey to learn which plays a major role in shaping one's thoughts, the person one is. 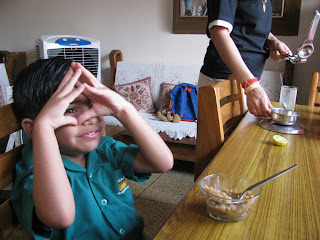 I am glad Vansh was looking forward to it with much enthusiasm, one because he would have to get up at 7:00, exactly 10 minutes before dad leaves for office and would thus be able to bid him goodbye, somethig which he missed doing here but needed a school to go to to wake him up at that hour. And two because, smitten as he is by everyone scurrying about in the morning picking up their bags, lunch boxes, THEIR ID CARDS, he was way too excited to do that himself and to be taken to school in a yellow school bus. He had been talking about this day for a long time. And even though he shouted that he wanted to sleep some more when I first woke him up, it took him the shortest unit of time to get up and about as I reminded him that this was indeed the day. HE was quick with finishing his milk, getting ready for his bath, wearing his brand new school uniform (which he would have liked to be in a different color), followed by breakfast. I made 'bhori' for him today, one of his favorite breakfasts, which is basically a chapati crushed and mixed with some melted butter and sugar. I, Jiya and papa (Vansh's dada) dropped him off in the car today and I would go to pick him up in the afternoon and then board the school bus to let the driver know where his bus stop would be. So another couple of days before his dream of going alone in a school bus comes true :) On our way, my mind raced to exactly 4 years back when Vansh turned 2 weeks on this day. What was I doing at that time - getting him ready for his two week check up or coochie cooing to him as he lay awake at night? Scenes from these past years flashed by - the gurgles, the first wobbly baby steps, the toothless smiles, the tears as we first separated during his summer camp, the giggles that followed after a few days. And now this little baby from not very long back was a bright young boy with a twinkle in his eyes whom I was going to drop to his very first day at school. Yet again, it really has been 4 years?! He smiled on his way to the classroom obliging me with some good smiley shots. He looked just a tad bit apprehensive as we entered the classroom full of about 25 or so kids but nothing too bothersome. 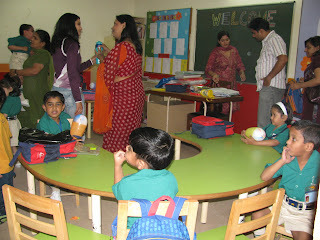 After meeting his classteacher, I settled him down on a semi circular table with about 5-6 chairs. He was immediately called on to the adjoining chair by another little boy sitting there and in a matter of minutes, as I returned after keeping Vansh's books on the front table, I saw both of them tapping the table with their hands and giggling. I was glad we had had several opportunities which had taken care of the tears earlier. 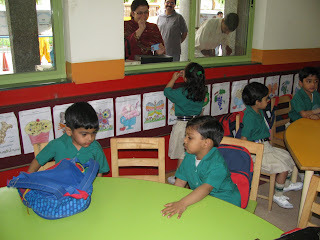 As we watched for a few minutes from outside the window, we just stood there and took in the scene as it unfolded before us - some kids were crying, a little girl was just sitting with her head on the table, some parents were talking to the teachers present in the room, a teacher was blowing bubbles to distract some children, Vansh sat on his chair watching everyone too. I thanked God for blessing us with such small everyday joys, of being a party to such little yet momentous occasions, of watching the fortunate kids and their families who can afford a good education in their element. Wishing you good and happy learning times Vansh! Congrats Vansh. You are now a big school goer. We all are proud of you. May god bless you. Congrats to Vansh. 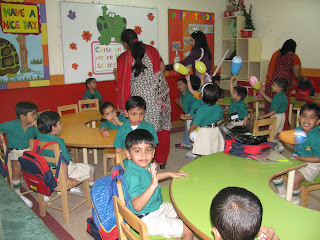 This indeed is very special & hope he always has fun at school & enjoys learning. Loved the pics. Vansh looks so cute. 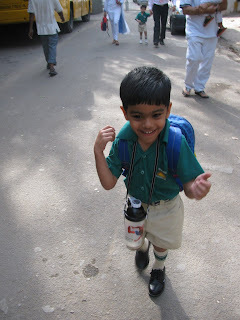 and yes, wishing vansh wonderful school memories and a whole lot of fun! Neera, definitely it is a huge step not only for the kiddo but for the mamma too. Wishing vansh best of things ahead. My boy would be starting montessori in a few days and i am looking forward to it. 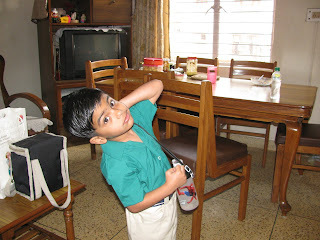 it is indeed a big step for vansh and for u...great, that he is well settled at school...wish him all the happiness. ashirwaad aur bahut saara pyar. Everyone: REally really appreciate your blessings and your good wishes. Sumana: Hope your little one has a terrific start :) Good luck! Congratulations. May he always enjoy this amazing journey of lifeand learning. All the best for ur great future. 4 year old, already ? !